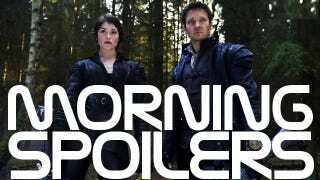 All the Latest Spoilers for Fringe, Once Upon a Time, and The Walking Dead! Check out a fascinating rundown of Fringe's final standalone episode. A Lost alum is returning to Storybrooke, under a new name. Michonne actress Danai Gurira previews the rest of The Walking Dead's third season. Tom Hiddleston praises director Alan Taylor's approach to Thor: The Dark World. Plus brand new TV spots for Hansel & Gretel: Witch Hunters and Monsters University! Nothing but spoilers from here on out! Top image from Hansel & Gretel: Witch Hunters. "It's fantastic, truly. We are making an amazing film, and we're having a wonderful time. It's so exciting to have established characters and an established setting in the world, and we are working so hard to cook up something new. That is what is exciting me — taking what we know, taking what we love and deepening it and giving it an extra dimension. I think director Alan Taylor is really shaping up the world of Asgard and the world of these characters." A tiny spark of hope As revealed in the above trailer for the episode, September and Walter's plan involves resetting time — which gives Olivia hope that she and Peter may see Etta again. But we've seen in the past that wishful thinking can be a dangerous thing, and Peter is hesitant to be even cautiously optimistic. One last sacrifice. This season, Etta and Nina both sacrificed their own lives for the greater good, making conscious decisions to die so that Walter, Peter, and Olivia could go on to save the world. In "The Boy Must Live," we learn that one more character we've grown to love will have to sacrifice his or her life in order to complete the plan. She's kind of going through a becoming. In the first half of the season, she's very powerful but she has people problems. She has trouble relating to them. [By the finale] you start to see that she knows she needs Rick and his group. She knows she needs community, and that sort of propels her into the second half of the season, which is probably closer to what people know from the comic books. She starts to try to take a different track, in terms of investing not only in herself and her own survival but in other people's, too. If she's becoming more of a people person, does that mean we might actually see her crack a smile? What are you talking about? She smiled in episode five! [laughs] She smiled in another episode, too, but it was cut out. These things I can't control. But I know she did it! You'll probably see more smiling going forward, but not a ton. A zombie apocalypse isn't the most jovial situation. Initially, she thinks Penny's alive, and she's actually very gentle with her. But then she finds Penny's a zombie and to Michonne, zombies are dead. She believes it's a very undignified way to function, so killing the little-girl zombie is actually a merciful act. [It's like] put her in a grave and put a cross on it and mourn her properly. But it's also oh, wow, this is what he loves. He took what I loved away [Andrea] and tried to kill me, so this is my perfect act of vengeance. I watched the first season when I was auditioning, and I definitely looked at how she was depicted in the graphic novels. Just looking at her image, her facial expressions, fed me. I felt like she had a war vet's type of PTSD [in the show], so I used PTSD materials and books. One of my plays [Eclipsed] is about women and war in Liberia, and they weren't soft, gentle or easy to read. They became warriors, so that definitely influenced Michonne as well. And here's a fairly low-quality promo for the February 10 midseason premiere, "The Suicide King." Here's a promo for the upcoming third season of the Canadian fantasy series, which begins January 6 in Canada on Showcase and January 14 in the United States on Syfy.